My little one is a macaroni and cheese fiend... and also one of the most strangely picky eaters that I've ever known. For most of her five years go life, my little girl has been a vegetarian for the most part. Of course, it's not been a conscious decision on her part or for any other reason than the mere texture of meat. Apparently it's a pretty common trend among toddlers and preschoolers. I can't say that I was much different when I was about her age. I drank water instead of any other sort of soda or juice (a good thing! ), and also had to be told that meat came from a meat tree and not from an animal. I also required that all meals be cooked by my mother. Yeah, I've always been a bit special about food. Over the past few months, my little girl has made some great strides in adding more and more to her list of acceptable foods. I'd like to think that it has a lot to do with the fact that I encourage her to spend time with me in the kitchen. I also do my best to encourage her to simply try new things. No pressure though! Lately, I've just put some new things on her plate without mentioning anything at all. When she asks about it, I let her know that I'd appreciate her just tasting something, and if she doesn't like it - then she can give it back to me. No questions asked. I also generally tell her about the food item; if it's a vegetable, fruit... how it's been cooked, what it might taste like or the texture to expect. We even talk about different tastebuds and what our tastebuds are telling us about what we're tasting. Is it sweet? Salty? Sour? So, today for our macaroni, I wanted to get some things in there that I know she likes, while sort of sneaking in something in there that's been turned away heatedly since day one. Chicken. Some of the things my little one does like? Well, as I mentioned, she loves macaroni and cheese. Seriously. She probably eats macaroni and cheese a solid five meals of the week. She also could enjoy her weight in bacon, but I mean... which of us couldn't? Just today she asked me at lunch if salt was bad for our bodies. I told her that salt was okay as long as it's in moderation, to which she responded that her pretzels have lots of salt. 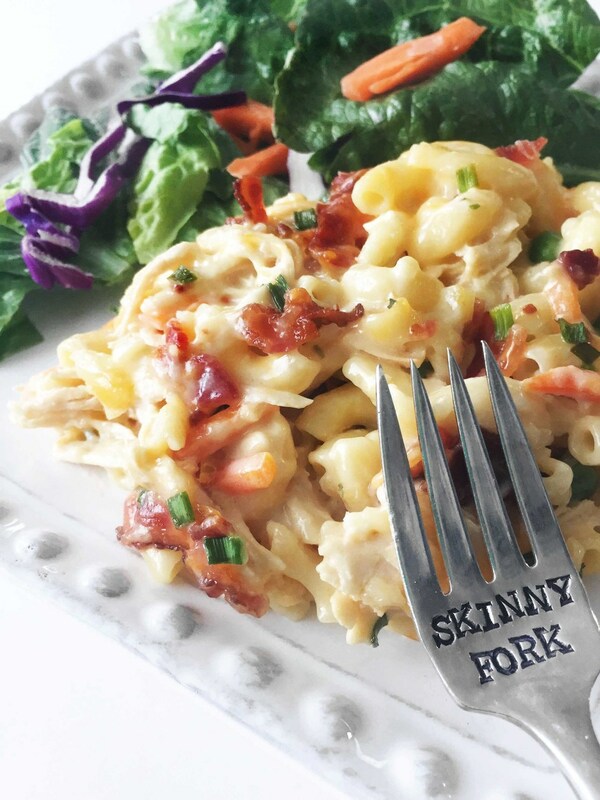 I did my best to make this macaroni into a more guilt-free and gluten-free variation by using gluten-free pasta, low sodium center cut bacon, light ranch dressing, and greek yogurt. What does all that mean? Well, you have a dish that's better for you without seeming like it at all! So how did the experiment today go? Well, I'm happy to report that all went accordingly. The chicken bacon macaroni and cheese was a resounding hit with the entire family. It was all I could do to manage to get a few shots of the full bowl of the finished product. Be sure to check out Horizon Mealtimes Solutions Pinterest Board. Or follow Horizon on Twitter or Facebook. Begin to prepare the macaroni & cheese according to the package directions. When the noodles are about halfway cooked through, add in the peas and carrots and continue to cook for the remaining time; and follow the package directions through. Once the noodles are done add in the chicken, 3/4 c. of the cheese, yogurt, ranch and diced tomatoes; stir carefully to combine. Transfer the mixture into a large oven safe baking dish; top with the remaining cheese, bacon, and chives. Cover the dish with foil and place it into the oven and bake for 20 minutes or until heated through and the cheese on top is all melty. Yes, melty. It's a technical term. Remove carefully from the oven once done and enjoy right away! I served mine with a nice fresh side salad.